On Saturday May 19, local veterans’ organizations and their auxiliaries blanketed Arlington Cemetery with a field of red, white and blue. Members of Field-Allen Post 148 and the ALA Unit 148 and other volunteers, met at Arlington Cemetery at 9 a.m. to place over 300 flags on the graves on the veterans. 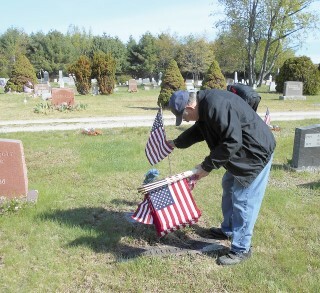 Earlier in the week, teams of veterans from the Legion and VFW Post covered approximately 30 cemeteries in Windham with over 875 flags to honor all the town’s veterans. Some cemeteries are in remote woodlots with only one or two veterans buried there. Other larger cemeteries such as Chase, Mayberry, Smith, and Windham Hill have dozens to over 100 veterans. Please thank a veteran for their service on this Memorial Day weekend.